In an exclusive interview for Park World, the ex-Disney Imagineer tells us more about his career creating attractions, the rise of interactivity and personalisation, and why he’s “jealous as heck” of the next generation. 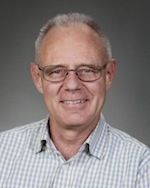 Joe Garlington led most interactive projects at Walt Disney Imagineering (WDI) from 1990 until February 2014. Starting his Disney career in 1980, working on projects for EPCOT, he went on to co-found Art & Technology Inc, designing interactive attractions for museums, zoos and theme parks. 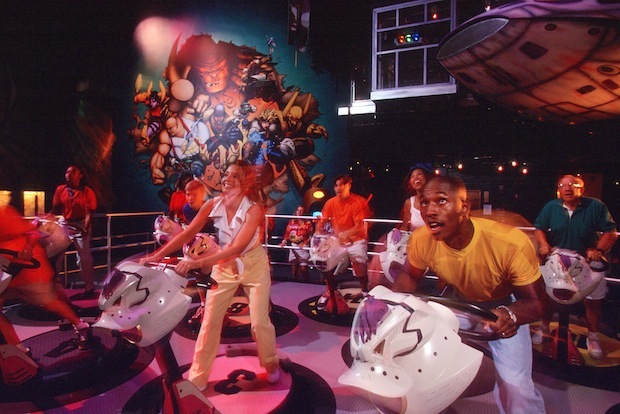 Returning to WDI in 1990, Joe developed attractions for all the Disney theme parks worldwide, including Turtle Talk with Crush, Stitch Encounter, Monsters Inc Laugh Floor, Disney Quest, The Sum of All Thrills and the interactive elements for Toy Story Midway Mania, Disney’s largest ever interactive dark ride. Recently one of Joe’s teams was responsible for giving Mickey Mouse a voice as he walks through the parks! Before Disney, the California native worked in the film industry on such movies as Star Trek – The Motion Picture, Caddyshack, Blade Runner and Firefox. Now retired from WDI, Joe is currently working on some light consulting within the industry, mostly restricted to brainstorming and idea creation. How did your early career prepare you for your time at Disney? As a college undergrad I studied anthropology and later art. The anthropology and my general curiosity about people helped me understand what the people I’m trying to entertain are thinking, feeling, wanting. That made it easier for me to provide entertainment that works for them. My art training as a sculptor and interactive artist helped me first in my work as a model/prop maker in movies and later in my early days at Disney. For example, I did the gopher in Caddy Shack. My graduate work at the California Institute of the Arts helped me think critically and over the long run that was the biggest thing my education brought me, the ability to think outside of the box, to look for and find new ways of entertaining. What are some of your proudest achievements with Imagineering? I’m most proud of three categories of work from Disney. First, I turned interactive design from something that any old designer did into a speciality. In the process, that made this kind of work a more important component of the industry. And it made the work better, forced it to be held to a higher standard than it had been held to before. Second, I pushed the frontiers of entertainment. WDI [Walt Disney Imagineering] celebrates its inventive culture but there is still a lot of work done there that follows established patterns. Mine never did. My teams pushed and pushed and pushed. I’m proud that they did and that I was able to help them do it. Third, I broadened the talent pool at WDI. Because interactivity had never really been supported before I arrived as I grew the specialty I was able to bring in lots of new talent. I have long believed that design teams should look like their audience; it is arrogant to think you can design for people you don’t understand. So, for instance, I brought in lots of women – I was the first manager to gender balance my team. And I brought in lots of technical folk, even though I am an artist and arts manager. The modern tools of development are no longer divorced from technology the way some artists seem to think they are. What projects in particular are you most proud of? Much that I pitched never got built, but the big custom-made games at DisneyQuest like Virtual Pirates of the Caribbean, Virtual Jungle Cruise, CyberSpace Mountain, the Animation Academy, the Living Character program overall, with specific shows like Turtle Talk with Crush, Stitch Encounter and Monsters Inc Laugh Floor; the games for Toy Story Midway Mania, all the early work that led to Magic Words with Mickey and Enchanted Tales with Belle are all projects my teams did that I am very proud of. Much of your work has appeared at EPCOT. How different is the EPCOT of today to that envisioned by Walt Disney? They have little to do with each other. Walt envisioned a model city with real people living in it and real factories as the exhibits. After he died nobody knew quite how to pull that off. I don’t think anybody remained who could have sold that idea to American business and Walt could not have afforded to do it on his own. So EPCOT today is a World’s Fair-like theme park, not a working, model city. I love it as a park, it is unique in the world, but it is pretty far from Walt Disney’s original vision. The term “interactive” is used commonly today within the industry. What for you is a true interactive attraction – is it just about technology or something more than that? 1) Passive, which can be mentally active as heck, where guests watch a performance developed by others. 2) Active, where guests become physically active (as in an “interactive” fountain) but where what they do does not change the programming. 3) Interactive, where guest input causes the progress of the show to change. In the end it comes down to who is responsible for the actions of the protagonist in the core story, the author (in a non-interactive experience) and the user (in an interactive experience). 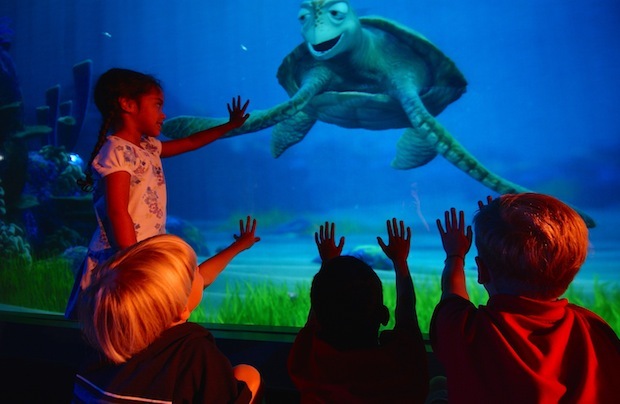 Does interactivity spoil an attraction designer’s ability to tell a story? This is a complex question. First, what do you mean by “story?” If, as Raul Fernandez suggests, “story” is simply an organising structure, then no, because you can organise a story to deal with guest input. In Turtle Talk with Crush, the story is based around a quid-pro-quo that Crush states early in the show, “I’ll tell you what it’s like to be a turtle if you tell me what it’s like to be a human.” The story can careen all over the place based upon specific input from the audience but the overarching story remains in place, held there by that premise and the structure we developed that the actors follow. The problem is, if you look at the larger history of entertainment, you find it divides into two grand traditions – storytelling and game playing, and they come from how we learn. We can learn by doing, but that is dangerous. If I am a child in a primitive culture and I grab my dad’s spear and head out into the forest to find supper, if I have no training I’m as likely to become supper for some other creature as to find a creature to become supper for me. So humans developed two abstracted forms of learning where the costs of failure were less severe: Learning by example and learning by (abstracted) experience. The former is the heart of storytelling, the latter the heart of game playing. Each has its own strengths. Storytelling’s strengths are that it shows you how to do things you’d be unlikely to be able to learn on your own. Learning by experience is often more powerfully remembered if for no other reason than it is almost always more multi-sensory. I can tell my young son dozens of stories about the horrors that will happen if he touches the hot stove, all he has to do is touch it once and he will remember that lesson forever. And there are certain things you simply can’t learn without practice. I’ll never be able to play the violin successfully, no matter how many times I’m shown, without practicing it myself. This gets to the heart of the issue. As a designer am I wanting to show/tell you something? Or am I wanting to create an environment where you discover something on your own? The reality is that most of us live our lives negotiating the middle, I learn theory from things that are shown me (stories), from friends and co-workers, and then I practice (interactively) to get better at them. And this is the real new frontier that lots of game designers, especially, are exploring. It’s what I see college students working on everywhere – How do I combine story and game? What’s your view on interactive dark rides? Like with any other ride, when they are done well I like them. When they are done poorly I don’t. I do think that as a class they are underrepresented in parks. 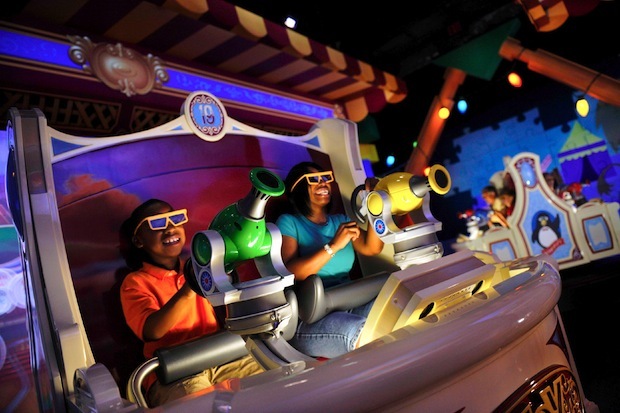 Do you consider Toy Story Mania a dark ride or a game? How did Turtle Talk come about, and were you worried about copycat projects emerging, as they now have? Turtle Talk came from the Stitch Phone booth that Disney R&D put into Innoventions at Disneyland. It was so instantly successful that we began to search for ways to grow it so that more people could share in the fun. I originally pitched the Turtle Talk concept as a pre-show for an attraction for the Tokyo DisneySea park. That attraction never got built though several years later we ended putting Turtle Talk #3 into the exact same spot it had originally been conceived for, though as an independent show. We knew that if we were successful others would attempt to copy it. But that is the nature of invention, isn’t it, that we all develop new things based upon older things. (To quote Newton’s line, “If I have seen farther than others it is only because I stood on the shoulders of giants.”) At its most fundamental Turtle Talk is an interactive puppet show and those go all the way back to Greek and Roman times. We developed a number of games for the kid’s clubs on the ships. We developed several ship-wide games, puzzle-mysteries to be solved using “living paintings” scattered around the ships. All were precedent-setting in the cruising world, and all have been very well received by their audiences. Have you had any involvement in the development of MyMagic+? How does this transform the Disney park experience? I was involved with the project early on. Kevin Rice, who I worked for at the time, led that effort creatively and he pulled me in. But later our joint teams had too much work to do so we did a “divide and conquer” with him focusing exclusively on that project while I took the other interactive work. So my knowledge is more theoretical than practical. What I always liked about its promise is its ability to personalise entertainment to you. As human populations grow each of us feels more and more to be just a cog in the machine. We want and need to be made to feel special. The word “interactive” is often code for “personalisation,” and the more we can know about you and your tastes the better able we will be to provide experiences that really get to the heart of your desires. My own belief is that these technologies are really infrastructure and that what is best about them is yet to come. 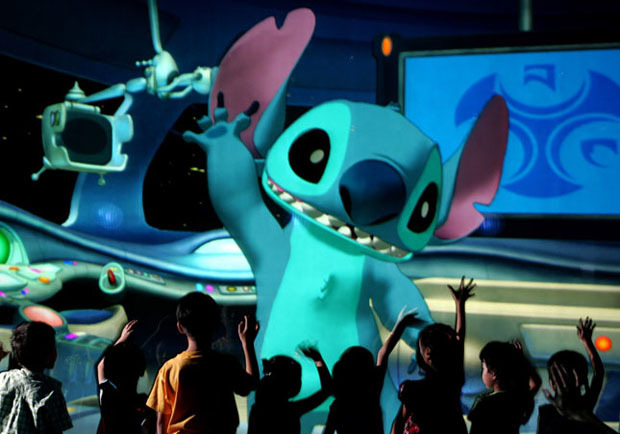 What emerging technologies do you believe have potential for the attractions industry and why/how? The conundrum theme park attraction designers seem to get presented with most often is how to create something “completely new and different,” with “30 years of proven reliability.” The answer to that conundrum has often been to pull tools from other industries into ours, using them in novel ways so the entertainment is new while gaining the reliability from the proven use elsewhere. For example, years ago Bill Novey, my old business partner and head of special effects at WED Enterprises [Walt Disney Imagineering] in the EPCOT days, was asked to make real looking lava for the Energy pavilion. He did so by using a pug mill normally used to make dog food. The mill mixed and pumped out glop that when lit from below looked like lava, but the machinery had long been proven reliable in factory settings. So almost any technology can get pressed into service in a theme park, it depends on the story you’re trying to tell. The obvious candidates are robotics, developments in that area are so rapid it’s only a matter of time before the next revolution in mechanised actors crosses into our world. 3D printers are something I’ve been following for almost 20 years. They are about to disrupt life everywhere; theme parks and museums will find new and intriguing ways to use them, too. Mark Bolas, a professor at USC [University of Southern California] recently said to me, “I’ve come to believe that pretty much everything predicted by science fiction is about to come to pass, including chips in the brain.” I’m with him on that. Themed entertainment and education is going to go through some massive upheavals. I am jealous as heck of young people today who are going to get to work in those worlds. As guests use technology more and more in their daily lives (notably smartphones and other devices) should theme parks embrace this as part of the attraction experience or offer an escape? All of the above. Theme parks today are the last of the broadcast media, but that is changing. More and more the niche marketing that has come to the core of so much of life is coming to us and we need to be able to embrace it. Some guests will want places to go where the pressures of the modern world seem to disappear. Others will want places where the bleeding edge can be experienced in ways they can’t yet afford on a daily basis. The industry should provide entertainment on both axis. What will be the theme of your presentation at SATE? My talk at SATE will be about why we all seem to think that “story” comes first, when in fact “experience” does. How important are organisations like the TEA in encouraging new talent to join the industry? I came into the industry knowing almost nothing about it, drawn in by a friend when I was out of work in the film industry due to an actor’s strike. Anything has to be better than that. If I look at what is happening in education, colleges are beginning to teach courses in theme park design. All efforts that introduce new people into the industry are great. All efforts that organise the work so that it is more easily learned and so that we come out with higher quality products are great. TEA is helping greatly with both. The TEA was formed by several ex-Disney Imagineers, looking for new opportunities after the opening of EPCOT and Tokyo Disneyland. How have you seen the creative supplier base develop outside of Disney over the years? When I first arrived at WED/Imagineering there was still ride track in the parking lot. Now it’s years since we manufactured our own ride machinery (though we still participate heavily in the design). As the industry grows it allows more and more specialisation and that is only good for all of us. It makes us all more competitive since we have to challenge each other more to find points of differentiation. But it also means that elements are built more professionally and to higher standards. Who wouldn’t want that? Joe Garlington was one of the headline speakers at September’s SATE (Storytelling, Architecture, Technology and Experience) conference from the TEA (Themed Entertainment Association) in Sarasota, Florida. Keep up to date with the TEA on Twitter.